Compared to the 2-electrode sensors, the TetraCon® 4-electrode measuring procedure offers considerable application targeted advantages, especially in the area of higher conductivities. TetraCon® 700 conductivity sensors are especially suitable for use in wastewater treatment plants dealing with highly loaded sewage. Due to the special measuring technique employed, severe influences from polarization effects are eliminated, resulting in improved accuracy of the sensor. Provided the devices are installed in accordance with the manufacturer`s instructions, errors due to the distortion of the current and voltage fields are also avoided. The special cell geometry of the TetraCon® 700 makes it impervious to fouling, and the abrasion resistant carbon electrodes are also easy to clean. The modern epoxy resin encapsulation technique used diminishes the likelihood of sensor breakage in harsh industrial environments. The TetraCon® 700 as digital model TetraCon® 700 IQ is also available for connection to IQ SENSOR NET. This version is specially featured by a larger measuring range (10 µS/cm … 500 mS/cm). Furthermore, TetraCon® 700 SW seawater model for fishfarming has proven quality for harsh weather conditions, in salt water and with wave action. Rugged conductivity sensor (4-electrode design), with integrated dual thermistor, abrasion resistant carbon electrodes and break-proof epoxy body; measuring range 10 µS/cm to 1000 mS/cm. 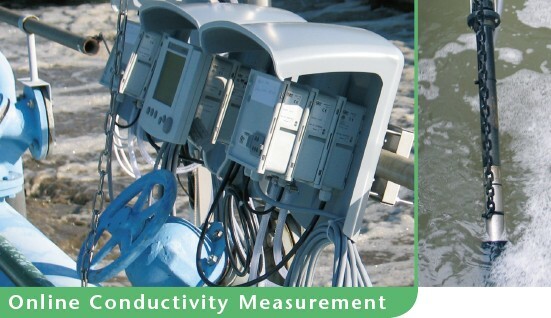 Submersible sensor assembly specially designed for use in wastewater treatment plants. 4-electrode conductivity cell with graphite electrodes, integral temperature probe; measuring range 1 µS/cm - 2000 mS/cm. Suitable for universal applications. 4-electrode conductivity cell with integral flow-thru chamber (7 ml volume), built-in temperature sensor; measuring range 1 µS/cm to 2000 mS/cm. Recommended for standard industrial applications. Digital 4-electrode conductivity cell (same as TetraCon® 700). In addition to the general preferences of IQ technology the TetraCon® 700 IQ offers the benefit of a larger measuring range (10 µS/cm … 500 mS/cm). Click the button below to add the Conductivity Meter / Sensor TetraCon® to your wish list.